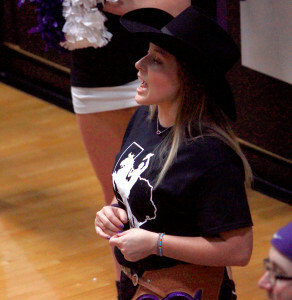 The campus mascot said she is loving her job as Texan Rider and still has not fully overcome the excitement and shock of reaching her long-awaited goal. 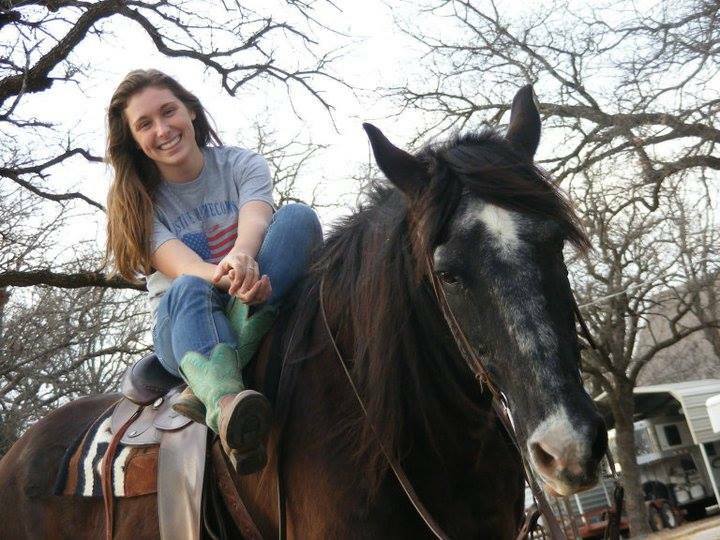 Rachel Hitt, a 20-year-old junior kinesiology major and part-time youth director at Hamilton United Methodist Church, became the new Texan Rider at Tarleton State University during the summer of 2015, after the previous Texan Rider, Jordan McCrory, graduated in May. Hitt said that she is now living a life-long dream. Rachel Hitt cheered on the Texans at a men’s basketball game versus Texas A&M Commerce. 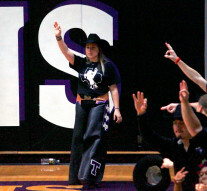 Hitt said that her love for Tarleton stemmed and grew, because she regularly drove the route through the town and enjoyed what she saw in Stephenville. “My grandma was in a tiny town called Gustine, and I drove through Stephenville my whole life to go visit her,” Hitt said. She also said she once had dreams of being involved in rodeo, and she knew Tarleton was the place for that. Hitt has a black horse named Kokomo, and she hopes to have him on the fields with her at events in the upcoming semesters. McCrory, the Texan Rider before Hitt, had an accident last year while on her horse at a university football game. The accident resulted in a minor injury to her neck and shoulder that she did recover from, but she was physically unable to ride her horse at the events between the accident and her graduation. Regardless of McCrory’s experience, Hitt plans to go through the long, technical process of preparing to bring Kokomo on campus in the future. Rachel Hitt poses with her horse and other half of the Texan Rider mascot duo, Kokomo. “There’s a lot of work and stuff that goes behind putting a horse on the field. You can’t just take a horse and put it on the field. You need a vet team. You have to have these special boots for the horse. You have to have the band practice so (the horse) is used to the band,” said Hitt. She also said that the reason for the entire process is to keep everyone safe. “You just can’t put the horse out in that environment for the first time ever in front of a bunch of people, because someone’s gonna’ get hurt or the horse is gonna’ get hurt,” she said. Hitt added that Kokomo is a dream horse of hers that was given to her after 4 years of watching and wanting him. According to Hitt, Kokomo is a very calm and reliable horse, and he spends his days with other horses in her hometown of Arlington, Texas. “He is the most chill horse I’ve ever come across in my entire life. He’s also 34-years-old. We’ll go on a trail ride—he still loves going out and being ridden—and there’ll be a line (of horses and riders), and something happens, and all the horses jump one way, and he just stays there and keeps going. He’s very, very chill,” she said. She also said Kokomo stays in Arlington for the sake of his happiness.